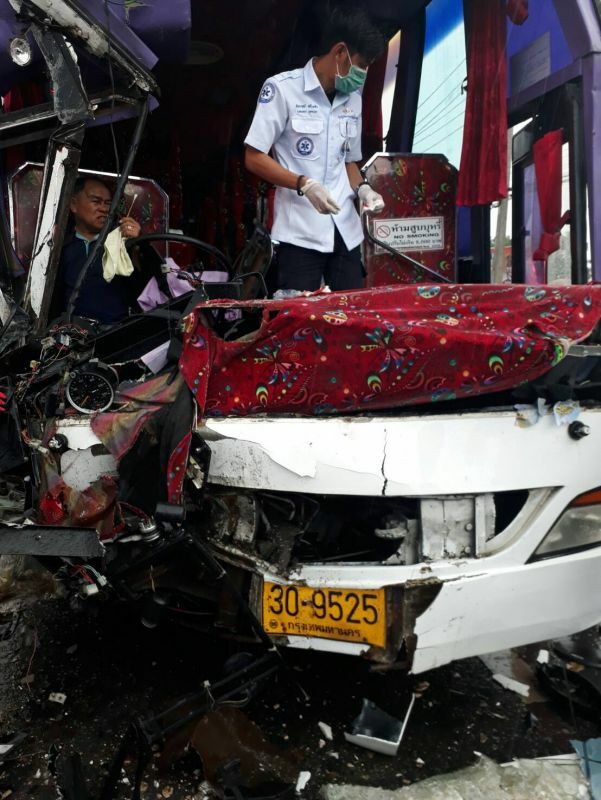 PHUKET: A 62-year-old Phuket bus driver suffered minor injuries following a collision with an out-of-control six-wheeler truck in Wichit this afternoon. There were no passengers on board when the accident occurred. 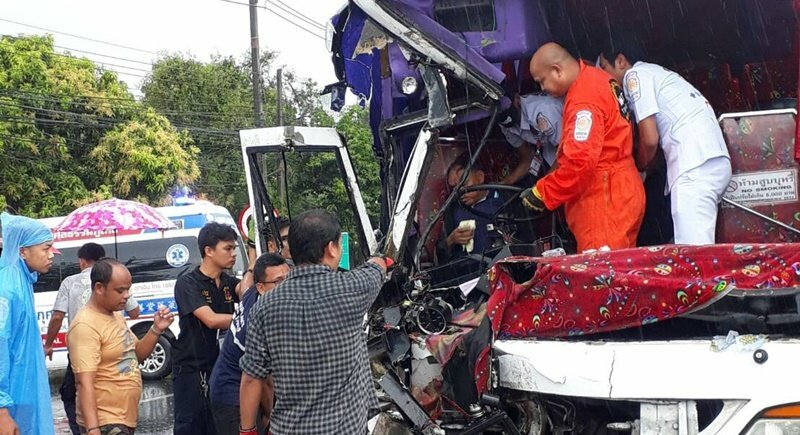 At 2:30pm today (Feb 27), Capt Eakkarat Chartphai from the Wichit Police was informed of an accident between a tour bus and six-wheeler truck at the Muang Thong Junction on Sakdidet Rd, Wichit. “When we arrived at the scene with rescue workers the driver of the bus was still trapped inside the vehicle. It took rescue workers 20 minutes to get the driver out using the Jaws of Life,” he said. 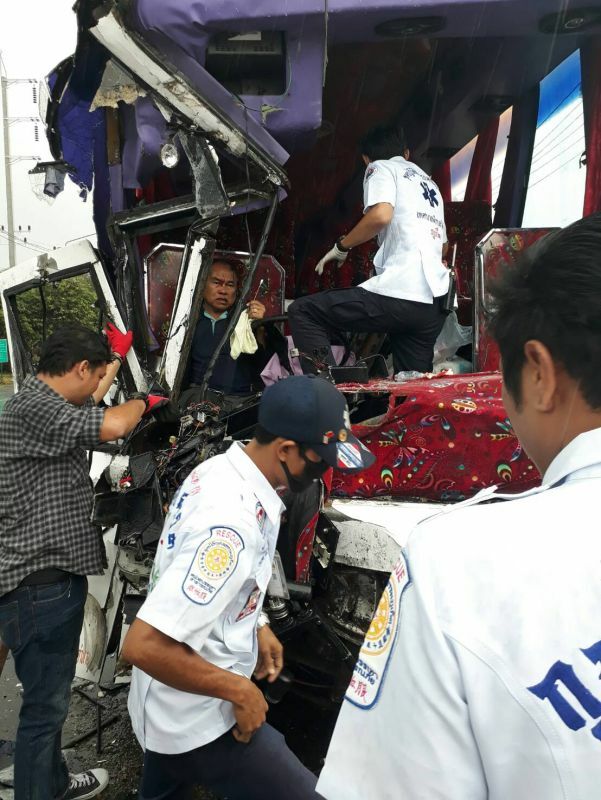 “The driver, Saman P้hansri, 62, only suffered minor injuries and was taken to Vachira Phuket Hospital,” he added. Capt Eakkarat went on to say that it was raining heavily when the accident took place. “The bus was heading from Phuket Town towards Ao Makham to pick up tourists. 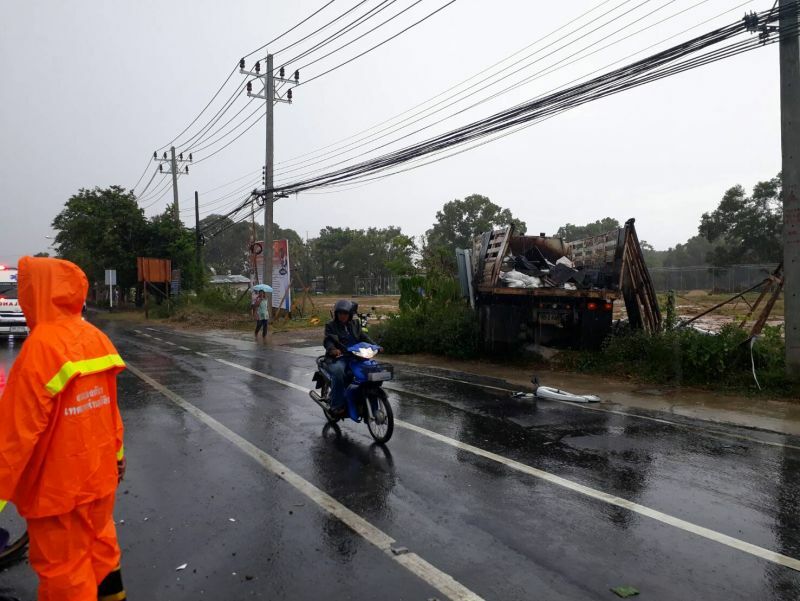 It was raining heavily and when he was passing through Muang Thong Junction an out-of-control six-wheeler truck crossed into his path and collided with him,” Capt Eakkarat explained. “Lucky the bus had no passengers on board when the accident happened,” he added. Police are continuing to investigate the incident and it is not yet known whether charges will be pressed against the driver of the six-wheeler truck. Why they allow public transport and trucks to drive on Phuket when it is raining or roads are wet? Blah Blah Blah. Same Same everyday. Wet road, windy, brakes fail due to not maintaining the lorry / bus AT ALL but never driver error. This is not news. What will be news in when the police start stopping the bad drivers and banning the broken cars, vans, lorries and buses from the roads. That will be news worthy. Never happen but can only imagine what Phuket will be like if managed correctly.